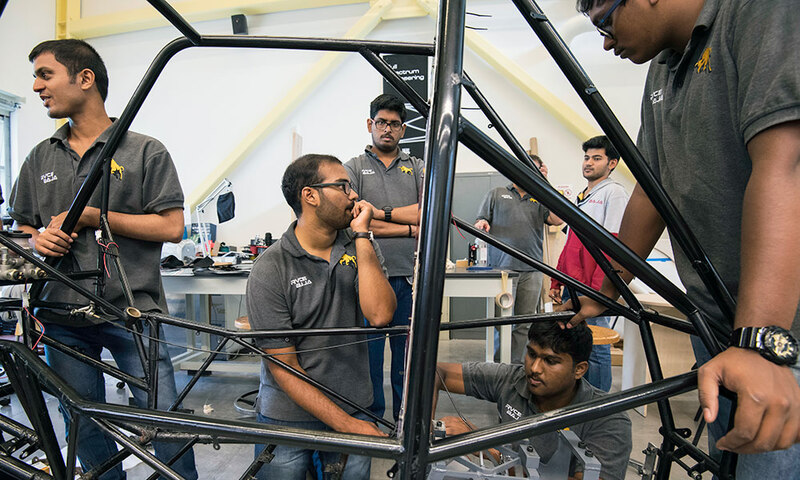 Anirudh Padmanabhan, (4th year) left, and Akhil Adike (2nd year) sitting, assemble components of the car for Team Helios Racing as teammates look on. The thought of assembling an all-terrain vehicle 8,000 miles from home on short notice was daunting to 14 engineering students from India. So before leaving for Rochester, Team Helios Racing took their car apart and put it back together. Piece by piece. Just for practice. “We did this many times,” Yash Mehrotra says. That ingenuity paid off when Mehrotra and other students from Rashtreeya Vidyalaya College of Engineering arrived in Rochester on Monday and learned that the box carrying their 300-pound, disassembled vehicle had yet to arrive at Rettner Hall, where the team was scheduled to rebuild it. It finally showed up Tuesday afternoon, three days later than scheduled. 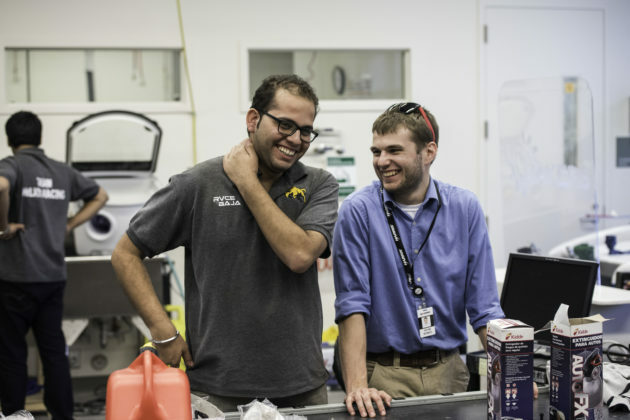 Yash Mehrotra from India’s Team Helios, left, shares a laugh with Kevin Bonko ’17, president of Rochester’s Baja team, at the fabrication lab in Rettner Hall. It took the team 6 ½ hours to assemble the car in Rettner’s fabrication lab. Wednesday, Helios raced it around Rochester’s River Campus practice track in preparation for this weekend’s Baja SAE World Challenge at Hogback Hill Motocross Track in Palmyra. The event is hosted by Rochester Institute of Technology and features 100 collegiate teams from around the world. More than 1,200 students will take part in the Society of Automotive Engineers race, from colleges such as Purdue, Ohio State, Cornell, Michigan State, and Johns Hopkins, plus teams from Canada, Venezuela, Brazil, and Mexico. Six teams are here from India. Design, safety, engine and technical inspections are at RIT’s Gordon Field House and Activities Center on Friday from 8 a.m. to 5 p.m. Dynamic events such as hill climbing, acceleration, traction, and land maneuverability competitions are Saturday from 8 a.m. to 5 p.m. at Hogback Hill. Sunday’s four-hour endurance race begins at 9:30 a.m. and is free and open to the public. The University’s Baja team is serving as ambassadors to Team Helios Racing. The students flew 19 hours, stopping at JFK International Airport in New York City, and arrived Monday. They are staying at a local hotel. Rochester’s new Baja president, Kevin Bonko ’17, says interaction with a highly regarded squad (Helios is India’s defending national champion) is a big perk of the University hosting the students. Alycia Abbott ’16, Rochester’s Baja president the previous two years, says the attraction is simple. Members of Team Helios are required to join as freshmen, and it’s the seniors who design the car. Rochester members can join at any time and do not have to be engineering majors. There are 34 on Rochester’s team, including eight recent graduates. Vikram Varanasi, a junior from Team Helios, says the thrill of Baja is its unpredictability. Team Helios’ connection with Rochester happened by chance. Mehrotra is the head of logistics and public relations for the group and started looking up potential lab venues in the area back in January. RIT was off limits since it’s the host site. Rettner opened in October 2013 and is named after University trustee and philanthropist Ronald Rettner. It offers students access to three floors of high-end technologies, including the engineering fabrication lab. Jim Alkins, Rettner Hall’s shop manager, says he hasn’t noticed any major differences in the way either team designs or assembles their off-road vehicle. Chris Muir, an associate professor in mechanical engineering, is advising both teams while Gracewski is away. He says watching the teams interact this week has been a memorable experience.